According to a recent announcement from Flickr, the users with the free account may lose some of their photos if they don’t update to a paid plan. Luckily Flickr is providing a way to export all of your photos and videos together with some meta data including useful things such as tags and albums. So we decided to write a small script, with the purpose of sorting the files in folders and extracting that meta data in a format, which can be later recognized by TagSpaces. The script iterates through all the media files in the export folder and copies the found files in sub folders. If file is part of album, a folder with the album’s name is create and the file is copied there. If this is not the case the script create a folder, which name corresponds to the date when the image was taken, and copies it there. In addition to that it parses the provided JSON file and extract the tags, the description and the comments if available. This information is saved in readable for TagSpaces JSON files, in the .ts sub folder of the folder where the image was copied previously. 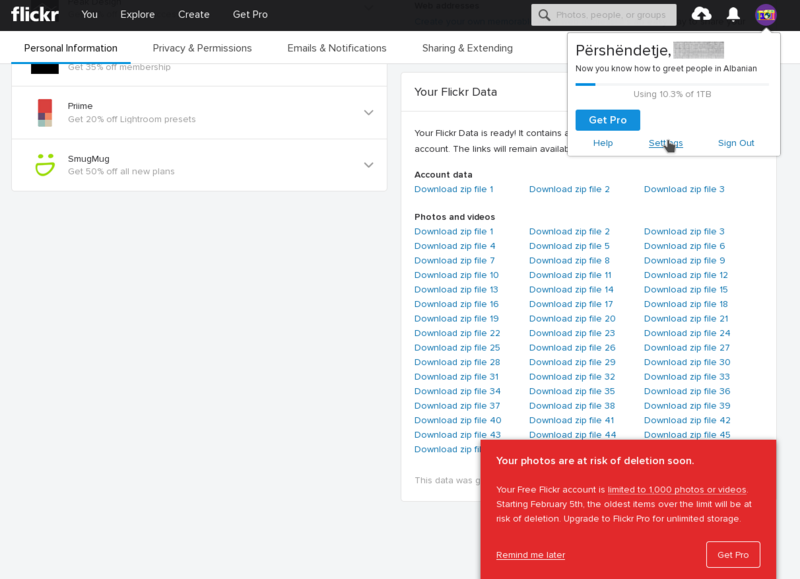 Your Flickr Data - You have to request and download your Flickr data, as shown in following screenshot. Go to “Your Flickr Data” area and request your files by clicking the “Request my Flickr data”. After a while the data is prepared and you have to download all the zip-files locally. You will need a running Node.js environment, which can be easily achieved on Windows, macOS or Linux by just installing it from here. Create a folder where the script will run. Download the last version of the script directly from here or from the release section of this project and place the script export-organizer.js in the previously create folder. Extract all files from all the zip exports in a sub folder called flickerData. After a successful run of the script a new folder flickrExport will be created containing your photos distributed in sub-folders. After the files are organized, you can create a new location in TagSpaces pointing to the flickrExport folder and open it. 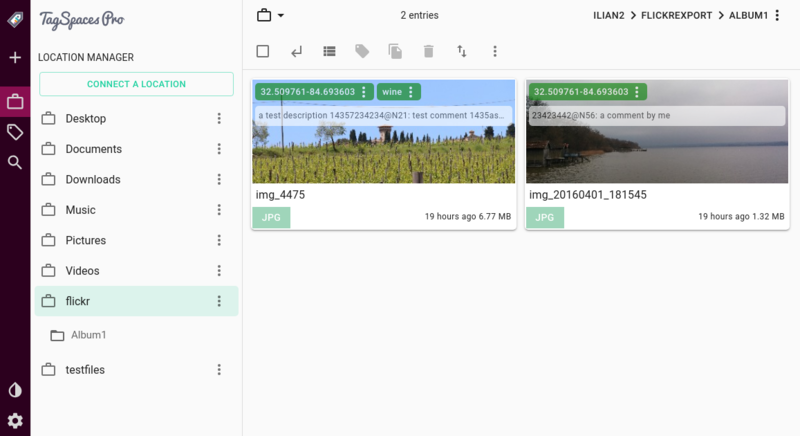 Now you will be able to navigate your photos in TagSpaces by albums and see the tags, description and comment you have added to your media files. Your don’t need of course TagSpaces for just browsing your photos by folders. This can be achieved perfectly with the Windows Explorer or macOS Finder, but if you have spend some time organizing your photos with tags, descriptions and comments and want to use this data somehow TagSpaces might be helpful. P.S. : If you are a TagSpaces PRO user you can even put your photos back to the Internet on a S3 compatible object storage such as Amazon’s AWS S3 and connect this storage with your local installation of the product, making your photos available from everywhere.